After I returned home from my vacation last week, there was a noticeable lack of dessert in the house. I had planned on making a simple pan of brownies (my husband’s favorite). Then, as I was perusing some food blogs, I came across this little gem and knew it was destiny. These brownies have everything: brownie, chocolate chips, crunchy Oreo bits, and peanut butter. By baking the brownies in a smaller pan, you get a nice tall, super fudgy brownie with wonderful chocolate bits nestled throughout. Then there is a wonderfully smooth chocolate peanut butter frosting topping the whole thing off. The flavors come together so beautifully, it just melts in your mouth! 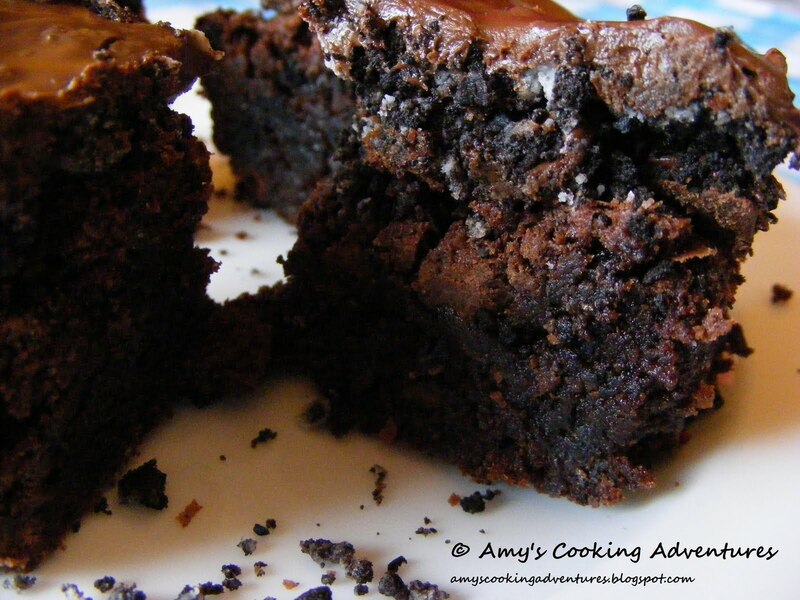 These are a chocolate lover’s dream! Preheat oven to 350 degrees F. Spray an 8x8 pan with cooking spray. Place the Oreos into a food processor and crush coarsely (alternately, place in a resealable bag and crush with a rolling pin). Set aside. Combine brownie mix, eggs, oil, and water and beat until smooth. Stir in ½ cup of the crushed cookies, and ½ cup chocolate chips. Spread the mixture into the prepared pan and bake for 45 minutes or until a toothpick inserted into the center comes out clean. Immediately after removing from the oven, sprinkle ½ cup chocolate chips and the remaining crushed cookies over the brownies. Return to the oven for 2-3 minutes. Meanwhile, place the remaining 1 cup chocolate chips and ½ cup of peanut butter into a microwave safe bowl. Microwave in 30 second increments, stirring each time, until the chocolate chips are fully melted and the peanut butter is mixed in. Spread the peanut butter mixture over the brownies. Let the brownies set overnight before cutting. Alternately, refrigerate for 2 hours before cutting. Ohmygoodness. Decadence on a plate. Well done! YUM, I wish I could eat a whole pan of those right now!! Death by chocolate, oreo, peanut butter heaven! I hate it when there's a shortage of dessert in the house! Oh dear. I feel like I've sinned just looking at them! Delicious!! These totally combine three of my favorite things, delicious!! 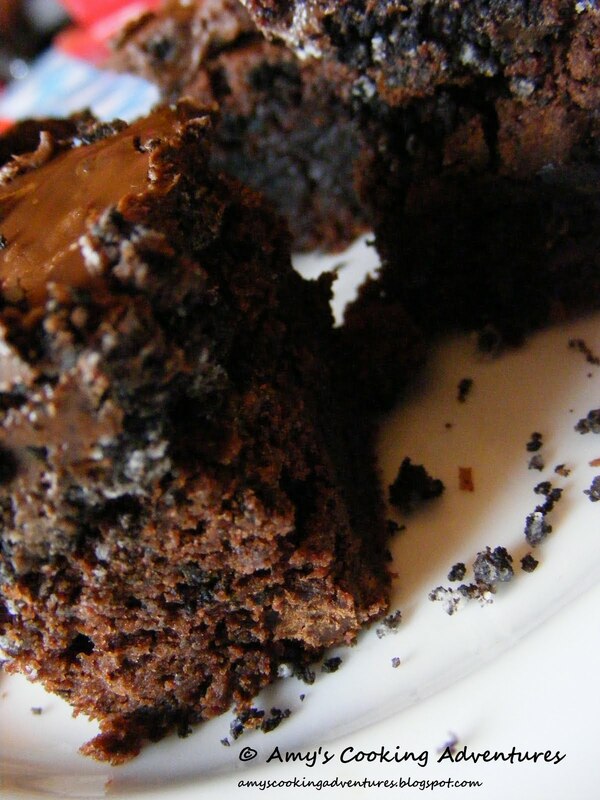 I love the sound of this brownie. Looks heavenly delicious! Oh my, that is delicious!! Quick and decadent! Great recipe! Delicious brownies. Love the peanut layer. Bet these were gone in minutes! Thank you for this recipe! (And also for the Printer-Friendly button - YAY!). Oreos AND peanut butter.. I think we have a winner here! These look delicious! I love the oreo peanut butter combo, add brownies and I might eat the whole pan!